This month’s Pro is Andy Libecki, Web Development Specialist at OnYourMark, LLC. Andy compares a variety of web browsers to point out their strengths and weaknesses.Which web browser is the best? It depends who you ask. Most people use Internet Explorer, since it comes with all modern copies of Windows. In fact, about 95% of Web Surfers use Internet Explorer. This isn’t necessarily a bad thing, because Internet Explorer does a very good job of interpreting HTML (the language used for setting up web pages). Note, however, that in some markets (like government) the preponderate of users employ Netscape (and older versions at that). Other full-featured browsers include Netscape, Mozilla FireFox (formerly known as Firebird), Opera, Safari (for Apple users) and Konquerer. These browsers are all freely available to anyone. There are additional browsers available, but many of them are still in beta (development) and don’t have as many features. With all these choices, how do you know which web browser to use? I’ll let you in on a little secret: it doesn’t really matter as long as your browser’s version is current! The technology of the web changes so fast that having a latest version of the browser is more important than the actual brand of browser you are using. If you’re using a very old browser, Netscape 4.7 or earlier, or Internet Explorer 4.0 or earlier, you should consider upgrading to a new version. The web has changed dramatically in the five years since these browsers were released! You can check your browser’s version by opening the browser as you normally would, then clicking “Help” in the menu and selecting “About.” If you have recently purchased a new computer, your browser is probably current to a fairly recent version… but it doesn’t hurt to check. If you’re an Internet Explorer user you may want to try some of the alternate browsers. Mozilla Firefox and Opera have some nice features that allow you to have multiple web pages open in a single browser window. This is very handy for people (like me) that tend to have many web pages open at once. Opera and Firefox also have a feature that blocks pop-up and pop-under windows. These features don’t affect how web pages display, rather they may make your browsing experience more enjoyable. The example above shows tabbed browsing using Mozilla. Three web pages are open; each page’s title is displayed in a tab at the top of the browser. 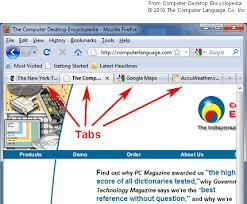 Clicking from tab to tab allows the user to view several web pages without having multiple windows open. If you want to keep using Internet Explorer but can’t stand pop-up windows, you may want to try the free Google Toolbar. The Google Toolbar has an optional setting to block pop-up windows. It also has an auto-fill function to complete online forms easier, and a search box that allows you to search Google and save past searches. If you use Internet Explorer, be sure to visit the Windows Update site to keep Internet Explorer (and the rest of the Microsoft programs on your computer) updated with the latest security patches. In addition, if you decide to upgrade your browser, you should consult the system requirements page for the updated browser you are downloading. If your computer does not meet the requirements, you should not download the new version! Previous Post Ask The Pro: How reliable is health advice on the Internet? Next Post Ask The Pro: What types of files can I send as email attachments?